Objective The aim of the study was to compare azathioprine versus mesalazine tablets for the prevention of clinical recurrence in patients with postoperative Crohn's disease (CD) with moderate or severe endoscopic recurrence. Methods This was a 1 year, double-blind, double-dummy, randomised study which took place in 21 gastroenterology centres in Austria, the Czech Republic, Germany and Israel. The study participants were 78 adults with CD who had undergone resection with ileocolonic anastomosis in the preceding 6–24 months without subsequent clinical recurrence and with a Crohn's disease activity index (CDAI) score <200, but with moderate or severe endoscopic recurrence. The study drugs were azathioprine 2.0–2.5 mg/kg/day or mesalazine 4 g/day over 1 year. The primary end point was therapeutic failure during 1 year, defined as a CDAI score ≥200 and an increase of ≥60 points from baseline, or study drug discontinuation due to lack of efficacy or intolerable adverse drug reaction. Results Treatment failure occurred in 22.0% (9/41) of azathioprine-treated patients and 10.8% (4/37) of mesalazine-treated patients, a difference of 11.1% (95% CI −5.0% to 27.3%, p=0.19). Clinical recurrence was significantly less frequent with azathioprine versus mesalazine (0/41 (0%) vs 4/37 (10.8%), p=0.031), whereas study drug discontinuation due to adverse drug reactions only occurred in azathioprine-treated patients (9/41 (22.0%) vs 0%, p=0.002). The proportion of patients showing ≥1 point reduction in Rutgeerts score between baseline and month 12 was 63.3% (19/30) and 34.4% (11/32) in the azathioprine and mesalazine groups, respectively (p=0.023). Conclusions In this population of patients with postoperative CD at high risk of clinical recurrence, superiority for azathioprine versus mesalazine could not be demonstrated for therapeutic failure. Clinical trial registration number NCT00946946. Data concerning the use of azathioprine for prevention of clinical recurrence after surgery are limited. Two small retrospective studies observed a benefit with azathioprine in terms of severity and time to clinical recurrence,13 14 while a randomised study of 81 patients reported a significantly lower rate of endoscopic recurrence in the first year postsurgery with addition of long-term azathioprine treatment to a 3 month course of metronidazole.15 A comparative randomised, multicentre, double-blind, double-dummy study in patients who had undergone resection and ileocolonic anastomosis confirmed that 6-mercaptopurine (6-MP) reduced the rate of postoperative recurrence compared with placebo, with a lower rate of endoscopic recurrence compared with mesalazine.16 Regarding azathioprine, an open-label, randomised trial by Ardizzone et al has compared outcomes postsurgery in 142 patients with CD receiving either azathioprine 2 mg/kg/day or mesalazine 3 g/day.17 At 2 years postsurgery, the rate of clinical recurrence was similar in both treatment arms on univariate analysis. Nevertheless, azathioprine was more effective than mesalazine in preventing recurrence in patients who had undergone more than one intestinal resection procedure. To date, however, no randomised study has compared the use of azathioprine or mesalazine for prevention of postsurgical clinical recurrence in high-risk patients who have already developed endoscopic recurrence. Early postoperative endoscopic lesions during the first few weeks following surgery have been shown to predict the risk of subsequent clinical recurrence.2 18 To assess the efficacy and safety of postoperative prophylaxis in these high-risk patients, a double-blind, randomised, multicentre, 1 year phase III study was designed comparing azathioprine versus mesalazine for the prevention of clinical recurrence in patients with CD with moderate or severe endoscopic recurrence following intestinal resection. This was a 52-week, double-blind, double-dummy, randomised study conducted at 21 gastroenterology centres in Austria (5), the Czech Republic (10), Germany (2) and Israel (2) during the period February 2002 to May 2007. The study was performed in accordance with the amended Declaration of Helsinki and the ICH Harmonised Tripartite Guideline for Good Clinical Practice. Written informed consent was obtained from all patients following regulatory authority and ethics committee approvals. Patients were randomised in a 1:1 ratio to azathioprine 2.0–2.5 mg/kg/day (Azafalk 50 mg tablets) or mesalazine 4 g/day (Eudragit L-coated 500 mg tablets (Salofalk)). As treatment with azathioprine or its placebo was based on a patient's body weight, a central randomisation was performed via five computer-generated randomisation lists (using the program ‘Rancode +’ (version 3.6) of IDV, Gauting, Germany), which were generated for the five body weight classes (40–50 kg, 51–60 kg, 61–75 kg, 76–100 kg and 101–128 kg), each in blocks of four, with medication distributed to each centre according to this list. To maintain investigator and patient blinding, patients randomised to azathioprine received verum azathioprine tablets and placebo mesalazine tablets; those randomised to mesalazine received verum mesalazine tablets and placebo azathioprine tablets. The following medications were prohibited during the study: immunosuppressants other than study drug, allopurinol, oxipurinol or thiopurinol, azathioprine-containing or mesalazine-containing drugs other than study drug, anti-TNFα therapy, oral antibiotics for >4 weeks or more than three cycles of 2 weeks, NSAIDs for >2 weeks, corticosteroids and cimetidine. Study visits took place at the participating centres at screening (7–14 days before baseline), baseline (day 0) and at weeks 2, 4, 8, 24 and 36, with the final study visit at week 52. Total CDAI score was calculated at each visit19 and the Inflammatory Bowel Disease Questionnaire (IBDQ) was completed at baseline and at weeks 12, 24, 36 and 52.20 Vital signs and laboratory values (erythrocyte sedimentation rate (ESR), C-reactive protein (CRP), haematology, serum chemistry and urinalysis) were measured at each study visit. Detection of TPMT activity and genotype, as well as red blood cell (RBC) concentrations of 6-TG nucleotides (6-TGNs), 6-methyl-mercaptopurine ribonucleotides (6-MMPRs) and 6-methyl-thioguanine nucleotides (6-MTGNs), was performed centrally at the Dr Margarete Fischer-Bosch Institute for Clinical Pharmacology (Stuttgart, Germany) as described previously.21 22 At the final study visit, endoscopy was performed and findings graded according to Rutgeerts score; endoscopy was also performed if patients discontinued study medication after ≥24 weeks. At both the screening and the final visit, the Crohn's Disease Endoscopic Index of Severity (CDEIS) was documented.23 Additional blood sampling and analysis (haematology and serum chemistry) was performed by the patient's family doctor at weeks 18, 30, 42 and 48. Adverse events were assessed at each postbaseline visit and categorised in terms of severity (mild, moderate or severe) and relationship with study medications (certain, probable/likely, possible, unlikely, conditional/unclassified or unassessable/unclassifiable). Patients were provided with diary cards to be completed daily, including information on body temperature (if elevated), stool frequency/type, abdominal pain and cramps, general well-being, consumption of study medication and other medication. The primary end point was therapeutic failure during 1 year, defined as a CDAI score ≥200 and an increase of ≥60 points from baseline (consistent with the definition of therapeutic failure used elsewhere8), or study drug discontinuation due to lack of efficacy or an intolerable adverse drug reaction. The main secondary efficacy end point was endoscopic improvement at month 12, defined as ≥1 point reduction in Rutgeerts score. Other secondary efficacy end points included the change in CDAI score, IBDQ score and CRP level from baseline and assessment of mucosal healing. Safety assessments included adverse events, laboratory parameters, vital signs, physical examination, levels of azathioprine metabolites and TPMT activity. Patients and investigators were asked to assess global tolerability as very good, good, satisfactory or poor. Data were recorded by investigators into a Case Report Form and then transferred to the study database using a double data entry procedure prior to electronic validation of the data. The primary efficacy variable (proportion of patients with therapeutic failure during 1 year) was compared between treatment groups using a χ2 test (two-sided test, α=0.05), with calculation of a 95% CI for the difference between proportions. Any patient withdrawn due to lack of efficacy or intolerable adverse drug reaction was assumed to have experienced clinical recurrence; all other patients in whom a CDAI was not documented at the final study visit were documented as missing. The sample size calculation for the primary end point estimated that 62 evaluable patients (31 per treatment arm) were needed to have 80% power to detect a difference of 35% in favour of azathioprine versus mesalazine for the reduction in the 1 year therapeutic failure rate (one-sided α=0.025) (nQuery Advisor 4.0, Statistical Solutions, Saugus, Massachusetts, USA). To allow for non-evaluable patients, a population size of 76 patients (38 per treatment arm) was planned. Quantitative variables are described using the mean±SD and/or median (range) as appropriate; qualitative variables are described by frequency. Where appropriate, 95% CIs are provided for differences between treatment groups for efficacy variables. Compliance was calculated as the number of used tablets in relation to the theoretical number of tablets to be taken during the study period. Patients with an overall intake of ≥70% of the study medication were considered to be adequately compliant. The intention-to-treat (ITT) population was defined as all randomised patients who received ≥1 dose of study medication. The per-protocol (PP) population comprised all ITT patients who met all inclusion and exclusion criteria, did not have any relevant protocol violations, were adequately compliant with study treatment and continued to receive study medication up to the final study visit. The endoscopic PP set was a subset of patients in the PP analysis set who completed two ileocolonoscopies (excluding patients who were treated with NSAIDs before the final endoscopy). The safety population was defined as all randomised patients who received at least one dose of study medication and provided ≥1 follow-up safety evaluation. Statistical analyses were performed using SAS software version 9.1.3. for Windows (SAS Institute, Carey, North Carolina, USA). Seventy-eight Caucasian patients were randomised and received study medication (41 azathioprine, 37 mesalazine) and formed the ITT population. Baseline characteristics were similar between treatment groups apart from a lower mean CDAI value in the azathioprine cohort (70 vs 102 in the mesalazine arm) and a higher proportion of azathioprine patients with a penetrating disease behaviour (66% vs 43%; table 1). Fourteen patients had major protocol violations, resulting in a PP population comprising 64 patients, of whom 59 patients were evaluable for the endoscopic PP analysis (figure 1). Patient disposition. ITT, intention-to-treat; PP, per protocol; AE, adverse event. The mean (SD) dose of azathioprine was 2.1±0.5 mg/kg/day and the mean dose of mesalazine was 3.9±0.2 g/day. Mean compliance, defined as overall intake of ≥70% of study medication, was 93% in the azathioprine group and 98% in the mesalazine arm. The primary end point (therapeutic failure due to clinical recurrence or discontinuation due to lack of efficacy or adverse drug reaction) occurred in 22.0% of patients in the azathioprine arm (9/41) and 10.8% of patients in the mesalazine group (4/37), with a difference in proportions of 11.1% (95% CI (−5.0% to 27.3%), p=0.19, two-sided) in favour of mesalazine (table 2). Clinical recurrence was significantly less frequent in the azathioprine cohort compared with the mesalazine group, while discontinuation due to adverse drug reactions was significantly more frequent in the azathioprine-treated patients (table 2). 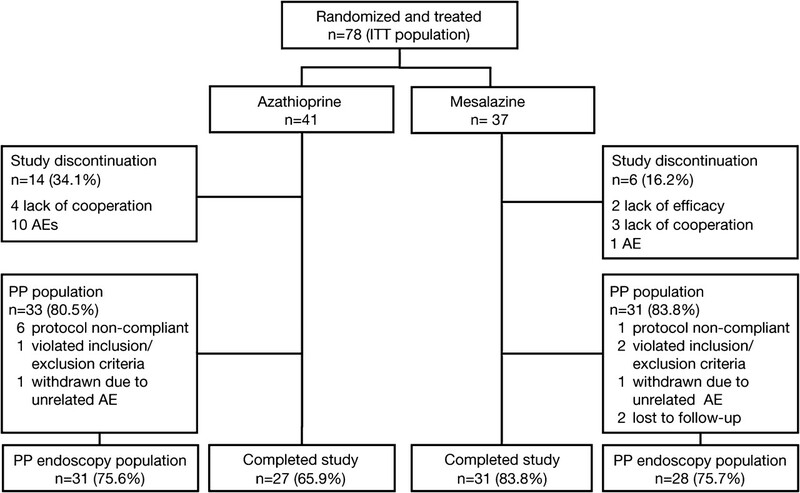 In the PP population, therapeutic failure occurred in 9/33 (27.3%) azathioprine patients and 3/31 (9.7%) mesalazine patients, with a nearly significant difference between treatment groups (17.6%, 95% CI (−0.8% to 36.0%), p=0.072, two-sided). Due to the low numbers of patients experiencing a therapeutic failure, no meaningful subgroup analyses of the primary end point were conducted. In the 14 patients who had previously received azathioprine (6 in the azathioprine group and 8 in the mesalazine group), clinical recurrence was observed in 2/8 patients in the mesalazine group. None of the 6 patients re-treated with azathioprine developed clinical recurrence (data were missing in 2/6 patients). None of these 14 patients had therapeutic failure due to adverse drug reactions. Endoscopic findings were analysed in all ITT patients in whom endoscopy was performed at baseline and at month 12 or at the time of study withdrawal, comprising 30 azathioprine patients (median time (range) from baseline to final endoscopy 365 days (176–381 days)) and 33 mesalazine patients (365 days (214–404 days)). The proportion of patients showing ≥1 point reduction in Rutgeerts score between baseline and final endoscopic examination was 63.3% (19/30) in the azathioprine group compared with 34.4% (11/32) in the mesalazine group, a significant difference of 28.9% (95% CI (5.1% to 52.8%), p=0.023, two-sided). The median improvement in Rutgeerts score was significantly greater in the azathioprine group (−1.5 vs 0 in the mesalazine cohort, p=0.007) (table 3). Significantly fewer azathioprine-treated patients had a severe endoscopic score (Rutgeerts i3–i4) at their final visit compared with patients in the mesalazine group (9/30 (30.0%) vs 19/32 (59.4%), difference −29.4%, 95% CI (−53.0% to −5.7%), p=0.020, two-sided). Similar findings were observed in the PP endoscopy group (data not shown). The mean improvement in CDEIS score was also significantly greater in the azathioprine arm versus the mesalazine arm (table 3). The mean CDAI score remained almost unchanged in the azathioprine group from baseline (70) to week 52 (last observation carried forward (LOCF)) (71), while the mean score decreased from baseline (102) by 16 points in the mesalazine group; the difference in change in mean score was not significant between cohorts (p=0.14, two-sided Wilcoxon test). The change in mean IBDQ score from baseline (azathioprine, 191; mesalazine, 175) to last on-treatment visit (azathioprine, 200; mesalazine, 180) was similar in both treatment arms (azathioprine 9±17.7, mesalazine 5±27.4; p=0.4565, two-sided Wilcoxon test). Geometric mean CRP level did not change with clinical relevance from baseline (azathioprine, 0.59 mg/dl; mesalazine, 0.51 mg/dl) to end of treatment (azathioprine, 0.47 mg/dl; mesalazine, 0.59 mg/dl) in either treatment group (mean change: azathioprine 0.17 mg/dl; mesalazine 0.08 mg/dl; p=0.15, two-sided Wilcoxon test). An overview of adverse events by system organ class is given in table 4. Overall, the incidence of adverse events was similar between the different treatment groups (azathioprine 34/41 (83%), mesalazine 32/37 (87%)). Adverse events with a suspected relationship to study drug (ie, adverse drug reactions) were more frequent in the azathioprine group (29/41 (70.7%)) than in mesalazine-treated patients (13/37 (35.1%); p=0.003, Fisher exact test). Ten adverse events were serious (all azathioprine patients) and three of those (all pancreatitis) were classified as at least possibly related to intake of the study drug. Approximately 24% (10/41) of azathioprine-treated patients withdrew prematurely from the study due to adverse events (5 pancreatitis, 1 pancreatitis/headache, 1 leucopenia and vomiting, 1 leucopenia and anaemia, 1 glomerulonephritis, 1 hyperamylasaemia). In contrast, only 3% (1/37) of mesalazine-treated patients were lost due to an adverse event resulting in premature withdrawal of study drug (1 macrocytic anaemia). None of the six patients in the azathioprine group who had received azathioprine prior to their surgery withdrew due to adverse events or clinical recurrence. Clinical laboratory evaluation reflected the prominent effect of azathioprine on white blood cells: leucocytes decreased below normal in 16% of patients on azathioprine, and in no patient on mesalazine. The increase in CRP above normal was similar in both treatment groups (18% of patients on azathioprine vs 19% of patients on mesalazine). Increases in pancreatic amylase and/or lipase above normal were found in 16% of patients on azathioprine and none on mesalazine. Abnormal liver tests were documented as adverse events in two patients (1 mesalazine, increase of transaminases; 1 azathioprine, increase in γ-glutamyltransferase). Almost half of the patients rated azathioprine or mesalazine as ‘very good’ in terms of global assessment of tolerability (49% and 46%, respectively). A ‘poor’ rating by patients was recorded only in the azathioprine group (15% of patients). Mean TPMT activity level at baseline was 42 nmol 6-MTG/g haemoglobin (Hb)/h and 41 nmol 6-MTG/g Hb/h in azathioprine- and mesalazine-treated patients, respectively. Inspection of the 1 year curves of TPMT activity did not reveal any significant changes in either treatment group. 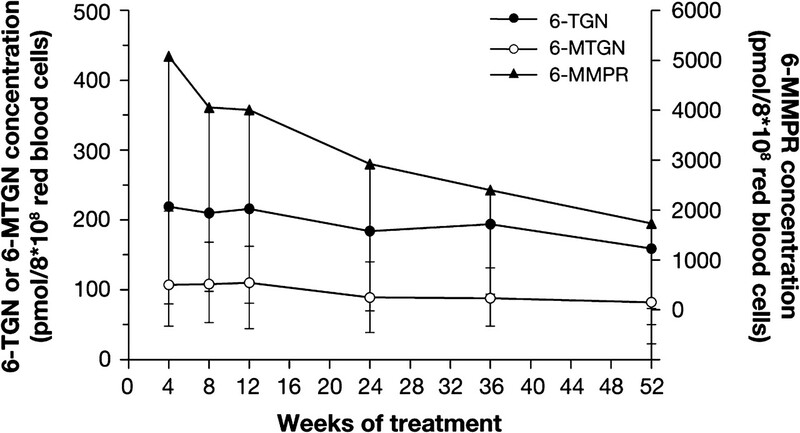 The course of 6-TGN, 6-MTGN and 6-MMPR levels over the 1 year study in the azathioprine group is shown in figure 2. Among the 19 azathioprine-treated patients who completed the study and for whom metabolite data were available, there was a significant decrease in metabolite concentrations between week 4 and 52 (6-TGNs, mean decrease 52 pmol/8×108 RBCs, p=0.040; 6-MTGNs, mean decrease 22 pmol/8×108 RBC, p=0.045; 6-MMPRs, mean decrease 3300 pmol/8×108 RBC, p<0.0001; Wilcoxon signed rank test). Concentration of 6-thioguanine nucleotides (6-TGNs, filled circles), 6-methyl-thioguanine nucleotides (6-MTGNs, open circles) and 6-methyl-mercaptopurine ribonucleotides (6-MMPRs, triangles) in patients with Crohn's disease receiving azathioprine 2.0–2.5 mg/kg/day over the course of 1 year. Data are presented as the mean±SD. Overall, 9.8% of patients (4/41) in the azathioprine group showed an intermediate TPMT phenotype that according to previous definitions24 entirely corresponded to TPMT genotypes *1/*3A (3 patients) and *1/*2 (1 patient). Interestingly, all TPMT *3A variant patients revealed haematotoxicity (leucopenia and/or anaemia (table 5)) which was the primary cause of azathioprine withdrawal in two cases. The median maximum level of 6-TGNs in these patients was significantly higher than in patients without haematotoxicity (714 vs 233 pmol/8×108 RBCs, p<0.017, Wilcoxon two-sample test). Unexpectedly, TPMT activity was found to be normal in two patients who had leucopenia and elevated TGN levels (table 5). Inspection of individual patient data did not reveal any association between TPMT or thiopurine metabolites and gastrointestinal toxicity (eg, hepatotoxicity or pancreatitis). Endoscopic recurrence is predictive of subsequent clinical recurrence after ileocolic resection for CD.2 18 The current study is the first specifically to evaluate medical intervention for the prevention of clinical recurrence following intestinal resection in patients with CD known to be at endoscopically confirmed high risk of recurrence. The high rate of study discontinuations due to adverse events in the azathioprine arm was broadly similar to that observed elsewhere in patients with postoperative CD,26 although one study of metronidazole in combination with azathioprine reported a lower incidence.15 Of note, pancreatitis was a contributing event to discontinuation in six azathioprine-treated patients in our population, a feature that has not been reported with comparably high frequency elsewhere. According to recent retrospective data in the literature, azathioprine-induced pancreatitis is more common in inflammatory bowel disease (incidence 5%) than in other autoimmune diseases.27 In transplant patients, the incidence of pancreatitis following azathioprine ranged from 2% to 12%.28 Therefore, the high rate of pancreatitis (15%) in our CD population may be surprising but explained by strict prospective safety monitoring. An interesting pharmacological finding from our study was the significant decrease in levels of thiopurine metabolites after 1 year of azathioprine treatment, consistent with our previous observations from another prospectively designed trial of azathioprine in patients with CD.21 Non-compliance can be ruled out as a possible explanation due to excellent results based on pill count data. Although we cannot currently offer a plausible answer for this observation, we suggest that TPMT-independent underlying mechanisms should be considered, since the 1 year curves of TPMT activity were unaffected. Of note, and in agreement with in vitro29 30 and in vivo22 results in the literature, heterozygosity for the TPMT *3A allele resulted in a significant alteration of TPMT function with haematotoxicity in all cases, with withdrawal of azathioprine due to intolerable adverse events in two out of three of these patients. Moreover, non-haematological adverse drug reactions were unrelated to TPMT, a finding that is in line with data from large-scale clinical studies.31–33 Taken together, these pharmacogenetic data support the view that TPMT testing could help to avoid azathioprine-related haematotoxicity. It is clear, however, that TPMT testing cannot explain all cases of leucopenia observed in azathioprine-treated patients since other possible underlying mechanisms, such as drug transport proteins (eg, MRP434), other thiopurine-related enzymes (eg, ITPase35 36) and viral infections,37 may contribute to the onset of adverse drug reactions. Some weaknesses in our study design should be addressed. As discussed above, the side effect profile of azathoprine and the low rate of clinical recurrence in the control arm (possibly due to an underestimation of mesalazine efficacy) were not adequately taken into account. Secondly, the time from last resection to study entry varied widely (azathioprine, 6–26 months; mesalazine, 6–20 months), such that the risk of clinical recurrence was heterogeneous within our population. Furthermore, due to the heterogeneity of the moderate endoscopic recurrence grade i2, we included only patients with lesions in the neoterminal ileum (ie, i2a), excluding patients with recurrence of grade i2b, for whom outcome is not completely clear. We are also aware that CDAI is not validated in the postoperative setting, although in the absence of any validated alternative scoring system for clinical activity we believe this to be the most appropriate monitoring instrument. We recognise that mild symptom exacerbations may not have met our definition for relapse based on CDAI score. For example, a patient with a baseline CDAI score of 180 in whom the score increased to 230 would not have been classified as a ‘relapser’. However, such a patient could have been withdrawn from the study due to lack of efficacy, in which case the patient would have been analysed as a treatment failure. Lastly, central analysis of endoscopic findings would have helped to avoid interobserver variability. Despite these limitations, we believe that our approach of selecting high-risk patients based on endoscopic recurrence offers a valuable model for future comparative trials of medical intervention to prevent postoperative recurrence in patients with CD. In conclusion, the unique design of the current study offers a novel data set that may assist in more accurate, individualised targeting of medical treatment to prevent clinical recurrence following intestinal resection for CD. The efficacy benefit of azathioprine, while clearly established, must be balanced against its side effect profile resulting in a high rate of discontinuation. It may be appropriate to reserve azathioprine treatment for patients known to be at high risk of clinical recurrence based on endoscopic recurrence; for patients who are intolerant to azathioprine or who have a lower risk of clinical recurrence, high-dose, Eudragit L-coated mesalazine could be an alternative treatment option. Routine endoscopic examination would allow identification of these at-risk subpopulations. Crohn's disease (CD) recurs in ∼50% of patients within 5 years after surgery. Therapeutic options for prevention of postsurgical recurrence are limited. Mesalazine is widely used as first-line prophylaxis after surgery for CD, but evidence is mixed. Data concerning the use of azathioprine in this setting are limited. This is the first double-blind, double-dummy, randomised study to compare the efficacy of azathioprine and mesalazine for prevention of postsurgical CD recurrence. Clinical recurrence was less frequent with azathioprine versus mesalazine (0% vs 10.8%, p=0.031), but study drug discontinuation due to adverse drug reactions only occurred in azathioprine-treated patients (22.0% vs 0%, p=0.002). Significantly more patients in the azathioprine group showed ≥1 point reduction in Rutgeerts score between baseline and month 12 (63.3% vs 34.4%, p=0.023). Due to its adverse event profile, azathioprine may be reserved for patients known to be at high risk of clinical recurrence based on endoscopic recurrence in the postoperative setting. For patients at a lower risk of clinical recurrence, Eudragit L-coated mesalazine appears to be an alternative treatment option. We thank Ms T. Plassmann and Mr C. Glasmacher from medicomp GmbH, Munich, Germany for their statistical support. Austria: Walter Reinisch, Georgiana Prinz, Sieglinde Angelberger, Alexander Teml, Marie-Luise Harrer, Karin Schweiger (Medical University of Vienna, Vienna); Wolfgang Petritsch; Jörg Jahnel; Heimo Wenzl (Karl Franzens University of Graz, Graz); Harald Brunner, Wolfgang Tillinger,Karin Mittischek (Lainz Hospital, Vienna); Peter Knoflach, Andreas Kirchgatterer (Hospital of the Merciful Sisters of the Holy Cross, Wels); Thomas Haas, Christian Datz, Hildegard Doppelmayr (Landes Hospital, Salzburg). Czech Republic: Milan Lukas, Martin Bortlik (General University Hospital of Prague, Prague); Zuzana Serclova, F Antos (The Bulovka Teaching Hospital, Prague); Josef Dosedel, Jiri Vavra, Robert Mudr (Hospital of Merciful Sisters of St Charles Borr, Prague); Zdenek Benes, Pavel Kohout (Thomayer Teaching Hospital & Postgraduate Medical School, Prague); Michal Konecny, Jan Gregar (Olomouc Teaching Hospital, Olomouc); Jiri Fabian, Pavel Sillinger, Josef Hajek, Robert Bok (Pardubice Regional Hospital, Pardubice); Vladimir Zbori, Lucie Prokopová (Brno Faculty Hospital, Brno); Olga Shonova, Marie Novakova (Ceske Budejovice Hospital, Ceske Budejovice); Jan Bures, Tomas Douda (Hradec Králové, Faculty Hospital, Hradec Králové). Germany: Eduard F Stange, Klaus Fellermann, Klaus Herrlinger (Robert-Bosch-Hospital, Stuttgart); Tilo Andus, Christoph Barth, Daniel Schnabel, Klaus Metter, Bernhard Fröhlich (Bad Cannstatt Hospital, Academic Teaching Department, University of Tübingen, Stuttgart). Israel: Simon Bar-Meir (Chaim Sheba Medical Center Tel Hashomer, Tel Hashomer), Iris Dotan, Guy Rosner, Stuart A Becker (Tel Aviv Sourosky Medical Center, Ichilov General Hospital, Tel Aviv); Fred Konikoff, Timna Naftali, Albert Pagel, Ariela Rauchwerger (Sapir Medical Center, Meir Hospital, Kfar Saba); Eran Goldin, Eran Israeli, Julia Ulitsky (Ein Kerem Hospital, Hadassah Medical Center, Jerusalem); Alexander Fich, Shmuel Odes (Soroka Medical Center, Beer Sheva).
. Surgical therapy for ulcerative colitis and Crohn's disease. Gastroenterol Clin North Am 1999;28:371–90.
. Predictability of the postoperative course of Crohn's disease. Gastroenterology 1990;99:956–63.
. Inflammatory bowel disease: medical therapy of specific clinical presentations. Gastroenterol Clin North Am 2002;31:185–202.
. Management of Crohn's disease in adults. Am J Gastroenterol 2009;104:465–83.
. Mesalamine in the prevention of endoscopic recurrence after intestinal resection for Crohn's disease. Italian Cooperative Study Group. Gastroenterology 1995;108:345–9.
. Oral mesalazine (5-aminosalicylic acid; Asacol) for the prevention of post-operative recurrence of Crohn's disease. Gruppo Italiano per lo Studio del Colon e del Retto (GISC). Aliment Pharmacol Ther 1994;8:35–43.
. Placebo-controlled clinical trial of mesalazine in the prevention of early endoscopic recurrences after resection for Crohn's disease. Groupe d'Etudes Therapeutiques des Affections Inflammatoires Digestives (GETAID). Eur J Gastroenterol Hepatol 1996;8:229–33.
. Prophylaxis of postoperative relapse in Crohn's disease with mesalamine: European Cooperative Crohn's Disease Study VI. Gastroenterology 2000;118:264–73.
. Prophylactic mesalamine treatment decreases postoperative recurrence of Crohn's disease. Gastroenterology 1995;109:404–13.
. A randomized, placebo-controlled, double-blind trial of mesalamine in the maintenance of remission of Crohn's disease. Gastroenterology 1997;112:1069–77.
. Mesalamine in the maintenance treatment of Crohn's disease: a meta-analysis adjusted for confounding variables. Gastroenterology 1997;113:1465–73.
. European evidence based consensus on the diagnosis and management of Crohn's disease: current management. Gut 2006;55(Suppl 1):i16–35.
. [Azathioprine for prevention of postoperative recurrence in Crohn's disease]. Tunis Med 2007;85:569–72.
. Azathioprine as a postoperative prophylaxis reduces symptoms in aggressive Crohn's disease. Scand J Gastroenterol 2006;41:1190–5.
. Therapy of metronidazole with azathioprine to prevent postoperative recurrence of Crohn's disease: a controlled randomized trial. Gastroenterology 2008;135:1123–9.
. Postoperative maintenance of Crohn's disease remission with 6-mercaptopurine, mesalamine, or placebo: a 2-year trial. Gastroenterology 2004;127:723–9.
. Azathioprine and mesalamine for prevention of relapse after conservative surgery for Crohn's disease. Gastroenterology 2004;127:730–40.
. Endscopy and MR enteroclysis: equivalent tools in predicting clinical recurrence in patients with Crohn's disease after ileocolic resection. Inflamm Bowel Dis 2010;16:198–203.
. Development of a Crohn's disease activity index. National Cooperative Crohn's Disease Study. Gastroenterology 1976;70:439–44.
. Quality of life: a valid and reliable measure of therapeutic efficacy in the treatment of inflammatory bowel disease. Canadian Crohn's Relapse Prevention Trial Study Group. Gastroenterology 1994;106:287–96.
. Monitoring of thiopurine methyltransferase activity in postsurgical patients with Crohn's disease during 1 year of treatment with azathioprine or mesalazine. Ther Drug Monit 2007;29:1–5.
. Comprehensive analysis of thiopurine S-methyltransferase phenotype–genotype correlation in a large population of German-Caucasians and identification of novel TPMT variants. Pharmacogenetics 2004;14:407–17.
. Development and validation of an endoscopic index of the severity for Crohn's disease: a prospective multicentre study. Groupe d'Etudes Therapeutiques des Affections Inflammatoires du Tube Digestif (GETAID). Gut 1989;30:983–9.
. SONIC: a randomized, double-blind, controlled trial comparing infliximab and infliximab plus azathioprine to azathioprine in patients with Crohn's disease naive to immunomodulators and biologic therapy. J Crohn's and Colitis 2009;3:S45 (P087).
. AZT-1 Study Group. Adverse events in clinical trials with azathioprine and mesalamine for prevention of postoperative recurrence of Crohn's disease. Gut 2006;55:1525–6.
. Azathioprine and 6-mercaptopurine for the prevention of postoperative recurrence in Crohn's disease: a meta-analysis. Am J Gastroenterol 2009;104:2089–96.
. Increased incidence of azathioprine-induced pancreatitis in Crohn's disease compared with other diseases. Aliment Pharmacol Ther 2004;20:843–50. Thomson Reuters (Healthcare) Inc. Anzathioprine. In: DRUGDEX® System [database on CD-ROM]. Greenwood Village, Colorado, USA: Thomson Reuters (Healthcare), 2010:143.
. Thiopurine methyltransferase pharmacogenetics: human gene cloning and characterization of a common polymorphism. DNA Cell Biol 1996;15:17–30.
. Thiopurine S-methyltransferase deficiency: two nucleotide transitions define the most prevalent mutant allele associated with loss of catalytic activity in Caucasians. Am J Hum Genet 1996;58:694–702.
. Pharmacogenomics and metabolite measurement for 6-mercaptopurine therapy in inflammatory bowel disease. Gastroenterology 2000;118:705–13.
. Methylated metabolites of 6-mercaptopurine are associated with hepatotoxicity. Clin Pharmacol Ther 2004;75:274–81.
. Thiopurine treatment in inflammatory bowel disease: clinical pharmacology and implication of pharmacogenetically guided dosing. Clin Pharm 2007;46:187–208.
. Transporter-mediated protection against thiopurine-induced hematopoietic toxicity. Cancer Res 2008;68:4983–9.
. Genetic polymorphism of inosine triphosphate pyrophosphatase is a determinant of mercaptopurine metabolism and toxicity during treatment for acute lymphoblastic leukemia. Clin Pharmacol Ther 2009;85:164–72.
. Inosine triphosphate pyrophosphatase and thiopurine s-methyltransferase genotypes relationship to azathioprine-induced myelosuppression. Clin Gastroenterol Hepatol 2006;4:44–9.
. Leukopenia due to parvovirus B19 in a Crohn's disease patient using azathioprine. Digestion 2009;79:211–14. Funding Dr Falk Pharma GmbH, Freiburg, Germany. Competing interests WR has received an unrestricted grant from Dr. Falk Pharma. EFS and KRH have received speaker's honoraria. KD, RG and RM are employees of Dr. Falk Pharma. SA, WP, OS, ML, SB-M, AT, ES and MS have no conflicts of interest to declare. In part, AT, ES and MS are supported by the Robert Bosch Foundation, Stuttgart, Germany. Ethics approval This study was conducted with the approval of the ethics committee at each participating centre.